The cold air stings my hands as the sun quickly sets behind the dark clouds above in the late afternoon. There is no snow, or any grass for that matter, on the lawn - just hardened soil and the occasional leaf left over from the fall. The world seems barren and brown, a lackluster look from its typical beauty. Kansas City Decembers are rarely a thing of beauty, trapped between the gorgeous fall colors of the autumn and the beautiful snowfalls of January and February. Instead, December is a marked end of the year here, and nature puts that ending on display. Because my backyard is a bit of a barren wasteland right now, I decided to walk down to the local wooded area behind my neighborhood for foraging. Despite how desolate it looks, I found an array of useful natural items to adorn my solstice altar! One such treat in the wooded area was hawthorn berries. A product of a shrub common to the northern hemisphere, these berries were historically used in teas and tinctures to treat issues surrounding the cardiovascular system. While many still use it for this purpose today, I would strongly suggest consulting a health professional before doing so. Many berries look similar to the hawthorn but can be poisonous when ingested. For the altar, I used these berries as a symbol of healing based on their healing properties, as well as protection. The shrub they come from contains a multitude of thorns (hence the name hawthorn). Thorny plants typically have protective magical qualities. These berries were clearly shriveled by the dry weather we've had recently, but they added the perfect pop of red needed for the altar! In between the berries, I added leaves from a still-green vine I found covering the ground. This red and green combination is perfect for Yule, the green representing prosperity and the red life. These leaves are ideal for the solstice altar anyway because they come from the partridge berry plant, a sprawling plant indigenous to my area. 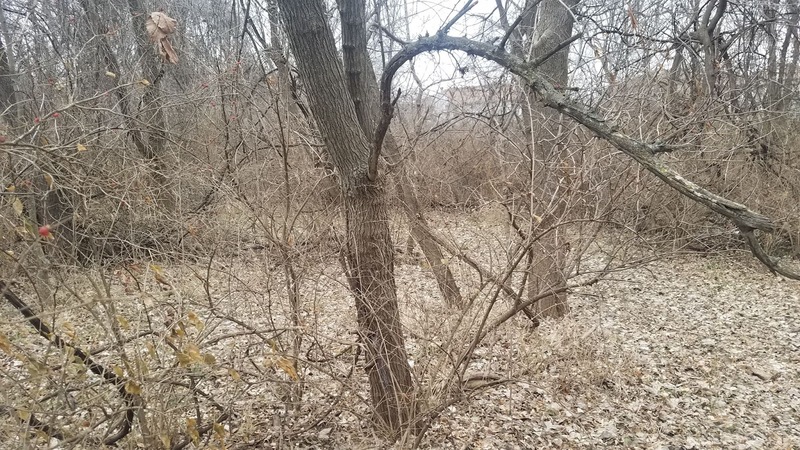 They stay green throughout the winter and are frequently kept in shady areas for that pop of color during the brown of the season. These vines can also produce adorable ornamental berries but this vine didn't seem to get the pollination it needed. This plant was historically used in teas for healing, especially during childbirth, and protection, so those traits carry over to the altar as well. I also used partridge berry vines around the base of the stump, again adding that pop of green surrounding the altar itself. Moving to the inside of the altar, I placed two pine cones on either side. Pine cones are common winter decorations, representing prosperity and fertility. They're also fantastic tools for cleansing, and I often used them as the base for smoke cleansing - that is, back before I adopted my parrot. I adorned the pine cones with more partridge berry vines along with beautiful, dark red leaves from a blackberry bramble - specifically the sawtooth blackberry. Blackberries are commonly associated with protection, prosperity, and healing, a reflection of all the traits already present on the altar. You'll also notice a theme of berries. Berries are commonly associated with the winter, and Yule in particular, because they store and cook well for the scarce months. In the center of the altar, you'll find a single white chime candle. This represents the light and warmth of friends and family, as well as the light coming after the darkness. The Winter Solstice is the longest night, after all, so the days will only get longer from here on out. The candle sits in a glass holder with salt to steady it. Salt is known for its cleansing and purifying properties, but it also makes a good representation for snow. Given that we had a heavy snow during early November and nothing since, and also knowing that January and February are usually the snowiest months for Kansas City, having a representation of snow on the altar seemed appropriate. Likewise, the glass represents ice, a common component of snow in the midwest. Finally, spiraling around the candle, I placed pine needles. Pine trees often symbolize strength and rebirth, themes that are common to this holiday. 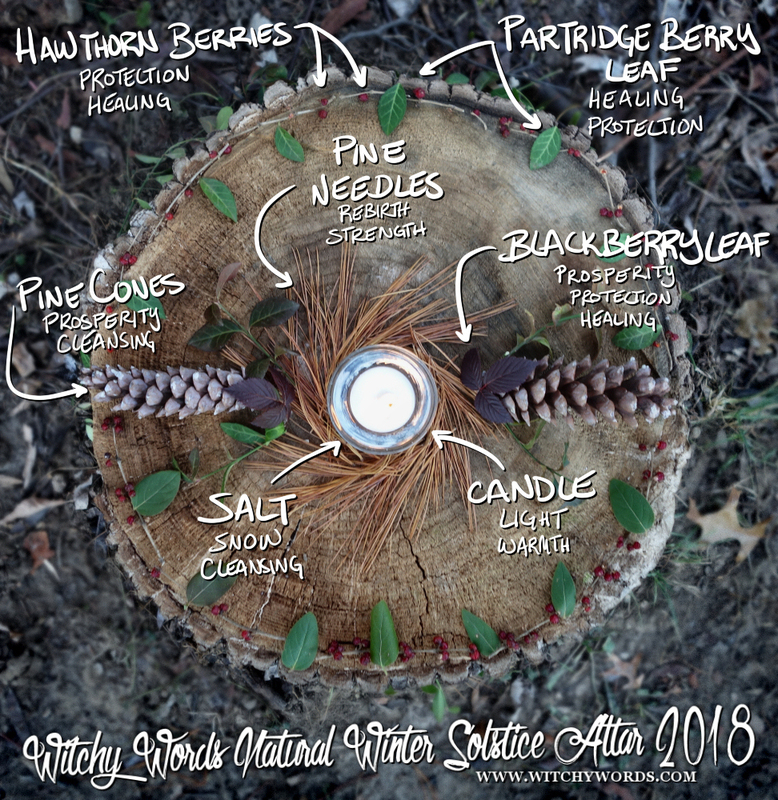 With themes of cleansing and protection, healing and prosperity, this altar fits the solstice holiday! What a perfect way to end this series. Below, you'll find the visual diagram. Enjoy! Beautiful, as always. I am glad you finished the year with such a perfect altar!